In what is probably the most disgusting display of animal cruelty you will read all day comes a story that might make you lose faith in humanity. People awoke to a horrific sight in the northern town of Agra, in the Uttar Pradesh province of India. The night before, construction workers were paving a road when they came upon a bit of a roadblock — a sleepy dog that didn't want to be disturbed. Instead of shooing it away, or coming back to complete the job later, they paved over the tired pup. They poured molten tar over the pooch and then ran it over. In the list of horrible ways to die, this must be at the top. The dog must have suffered excruciating, persisting pain until it finally expired. 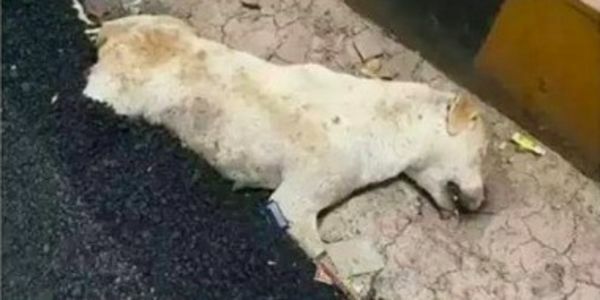 The workers claim they couldn't see the dog since they were paving at night but according to some locals, the workers heard the dog's howls of pain but chose to ignore it. The dog's body was recovered and given a proper burial, but it still hasn't gotten justice. As of yet, no one from the construction company, RP Infrastructure Limited, has been charged. Please sign the petition and demand that Agra's Sadar police find and prosecute those responsible for this crime.